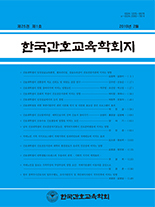 정명실,(2014).간호대학생의 의사소통 역량강화를 위한 자아존중감과 공감능력 및 대인관계 간 상관관계 연구.한국간호교육학회지,20(2),332-340. Purpose: This study was done to identify the relations on self-esteem, empathy and interpersonal relationship to reinforce competence in communication skills of nursing students. Method: Participants consisted of 84 entire 1st year students of a nursing college. Variables included self-esteem, empathy, interpersonal relationship and demographic variables. Data was analyzed by frequencies, ANOVA and Pearson"s correlation. Results: Satisfaction in nursing science of the subjects was 97.5% above average, Self understanding of the subjects was 93% above average. There were significant difference in self-esteem, empathy and interpersonal relationship among satisfaction in nursing science and self understanding of the subjects. Self-esteem positively correlated to empathy, empathy positively correlated to interpersonal relationship and interpersonal relationship positively correlated to self-esteem. Conclusion: In order to improve core competence in effective communication skills of nursing students, it is important to actively intervene for improving self-esteem and empathy and interpersonal relationship. Therefore, when organizing a communication subject of a nursing college, it is crucial to develop a program that leads to higher learning satisfaction of nursing study by improving self-esteem and empathy and interpersonal relationship skills.